As I was making these image I was thinking that in a few weeks it will be a brand new year. This year has been exceptional as far as creative growth is concerned. Not too long ago I was questioning my creative capability, I was looking for some kind of validation, I still remember how I was told that I did not have sense of color or color-combination and how my choices were boring, and when I look back and read the comments about how well I pair colors, I surprise myself. Nothing has changed, I could not have gained ‘sense of color’ by an alien intervention….the only thing that has really changed is the way I look at things. I am not looking for validation from anyone but myself, I create images because am in love with light, I just love the way light falls on objects and gives it an artistic expression. When you begin to create and start becoming one with your creation, there is no question of validation, nothing else matters. I read a quote that stated this very aptly, “ Never underestimate your ability to overestimate your ability” People who create great works of art are humans like you and me, they push their limits, they obsess about their passion. I hope I was not rambling and I hope I make some sense. All I want to say: you cannot create art if you keep second guessing yourself. I see myself giving ‘guan’, I so hate doing that, sorry guys! Heat panna cotta and turn off the heat just when it starts to bubble up. Heat the juice with spices, sugar and ginger, turn the heat off just before it begins to boil. In a small bowl add 2-3 tsp of cold water add 2 tsp of gelatin in 5 minutes add 1 tsp of warm pom juice to it and mix well, drain the gelatin water into the warm eggnog and mix well, let it sit for 5 min and you can pour it into the dishes. 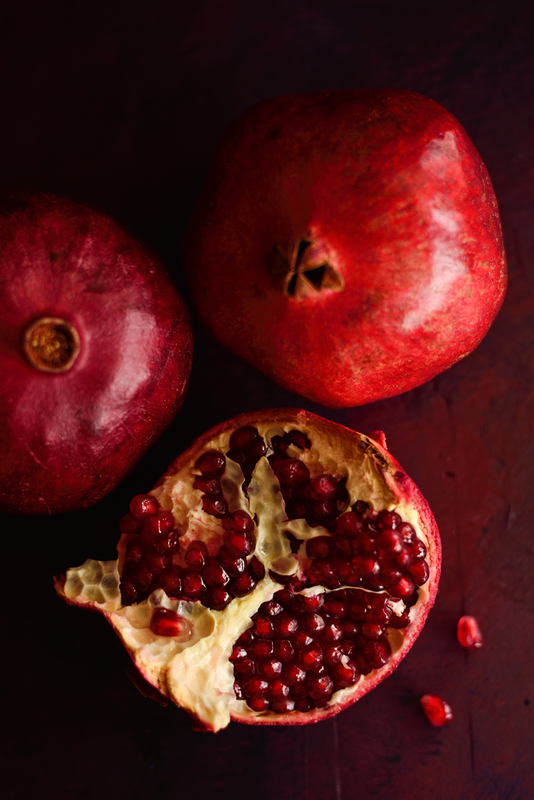 For pomegranate juice, remove the kernels and blend it on low speed for 4-5 min. Remove from blender and strain the juice. I have noticed when I make pom juice at home, it is slightly thicker and not such a rich color as store. It is entirely your preference. Heat the juice with spices, sugar and ginger, turn the heat off just before it begins to boil. In a small bowl add 2-3 tsp of cold water add 2 tsp of gelatin in 5 minutes add 1 tsp of warm pom juice to it and mix well, drain the gelatin water into the pom juice and mix well, let it sit for 5 min and you can pour it into the dishes. You can add the eggnog and let it set - takes about 3-4 hours. 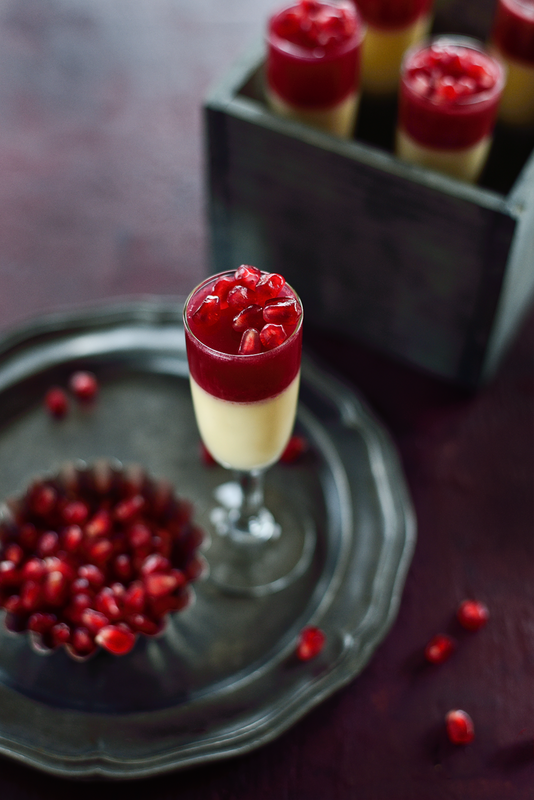 Then make the pom jelly and add it on top on the set panna cotta and another 2-3 hours for the jelly to set. 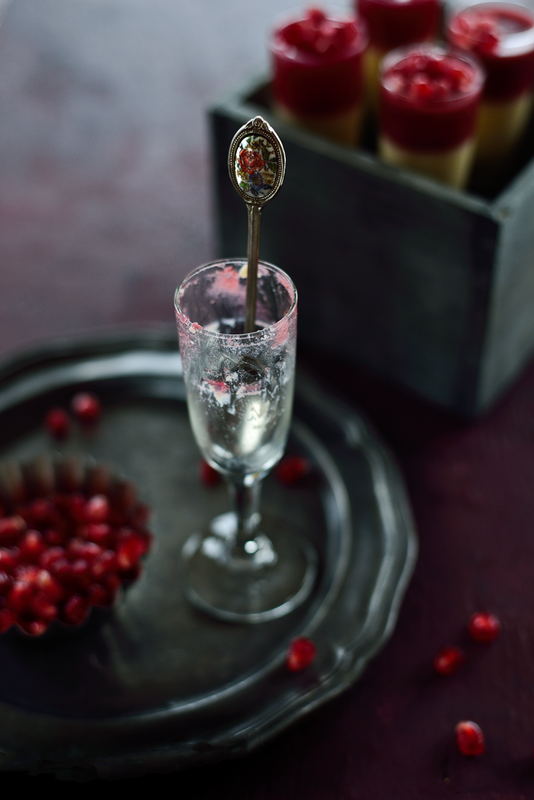 Garnish with fresh pomegranate and serve. Refrigerate to set the pannacotta and jelly. You are always an inspiration, Simi! 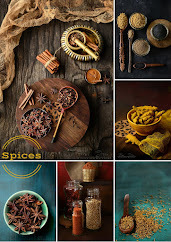 The fact that I absolutely love about your work is that your recipes match your creative abilities as well. This is hands down the best photography I've seen on your blog. You are brilliant! Wow ! Pomegranate is one of my favorite fruits. The ones selected for this post have an awesome crimson color. And you have created some really delightful and mouth watering stuff. A delightful dessert! Refined and exquisite. Your pictures are fantastic (I love the 2nd and last ones). Wow this looks so tempting...beautiful presentation!! 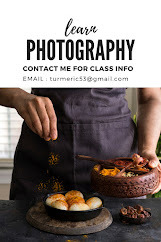 Gorgeous photography and really interesting recipe. Pinning this one!. Stopping by from the Weekend Social Linky party. Love this post! And your photos are superb!! A beautiful and festive dessert! Visiting from the Holiday Link Party, thank you for sharing. This not only looks delicious, it looks beautiful as well! What a great holiday dessert to dress up your table with and please your taste buds all at once....thanks for sharing! I wish I could try egg nog! I wanna know what all the rage is!! 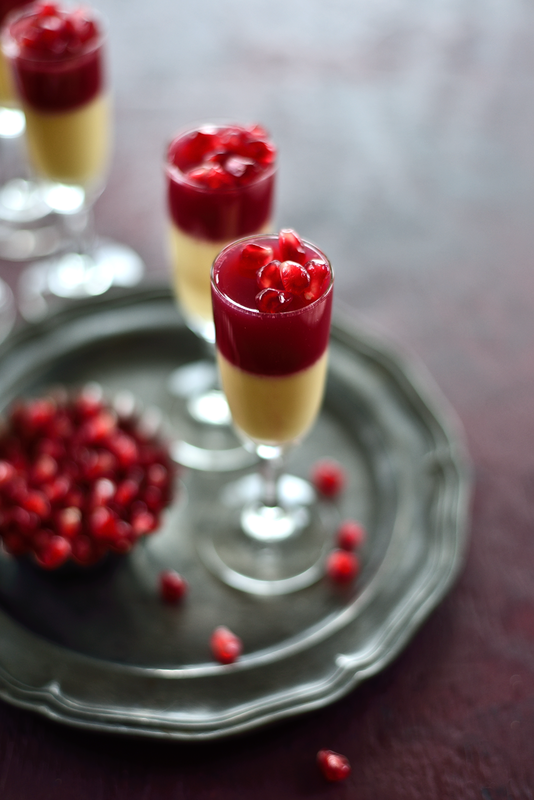 What an awesome and festive idea to make an eggnog flavoured panna cotta! This is definitely added to my Christmas Eve menu plan.. love it! 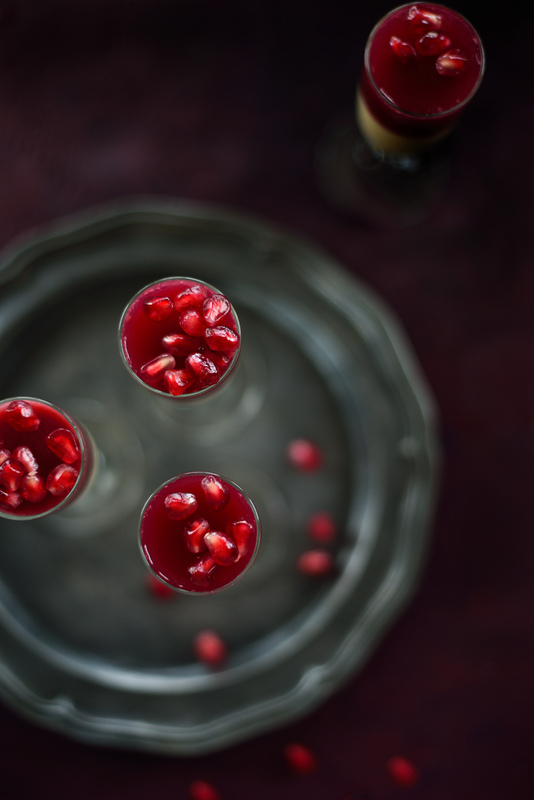 Pomegranate seeds always look amazing! 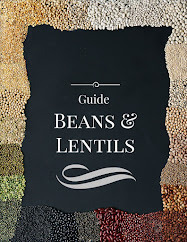 Wonderful recipe for the holiday season! Love it! This looks delicious and I would like to try it, but I'm a little confused by the panna cotta portion of the recipe. I assume it's meant to say to heat the eggnog and does it really have some of the juice mixed in?